How to Automatically Login to Windows 10 Start Screen without Entering Passwords? How to Automatically Login to Windows 10 Start Screen without Entering Password? Have you tried the multiple accounts available with Windows 10 Technical Preview? Do you want your PC to boot directly to Windows 10 desktop by skipping the initial Windows 10 login screen? Read further to know how you can configure Windows 10 to boot automatically to Windows 10 Start screen without having to enter any account password every time. In this article, you will understand tips to enable automatic sign in to Windows 10 startup screen. Windows 10 Technical Preview has introduced as well as retained lots of amazing features for this latest operating system from Microsoft (even before the latest Windows 10 Build 9926). One of the retained features (from Windows 8 or Windows 8.1 OS) was the possibility to use three different types of accounts such as Microsoft account, local account and domain account. Even though it is pretty nice to have so many options, it becomes a bit cumbersome to enter our account password every time the system boots to Windows 10. What if it was possible to skip entering password at Windows 10 login screen and instead boot automatically to the Windows 10 OS Start screen? You will be glad to know that we can configure Windows 10 for automatic login (or sign-in) without you having to worry about remembering the account passwords. Though entering account password during every boot enhances your OS security, you can opt for this automatic sign-in configuration in Windows 10 as long as you are the only user of your PC or laptop. This is because if your PC is also being used by others then they can access your automatically configured Windows start screen and confidential data stored on your PC. 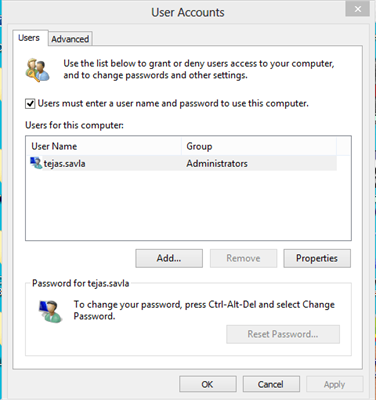 In this article, we shall go through the different methods to enable Windows 10 to sign-in automatically to any of the 3 accounts (provided you have the administrator access). In fact, this automatic login process for Windows 10 startup is pretty similar to the one we have in Windows 7 or Windows 8. 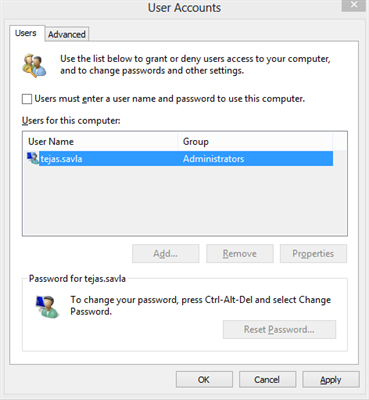 How to enable automatic login in Windows 10 using User Accounts settings? Press 'Windows key + R' keys together to open the Run command pop-up box. 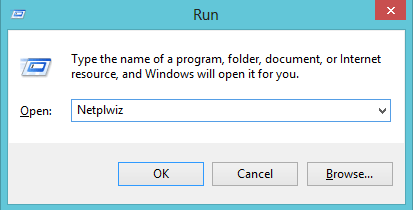 Type the text as "Netplwiz" in the Run command dialogue box and press Enter. This will open User Accounts pop-up box where you would see a ticked check box stating "Users must enter a user name and password to use this computer" under the 'Users' tab. You have to simply untick this check box i.e. remove the tick. Click on 'Apply' button under "Users" tab after the tick is removed in previous step. 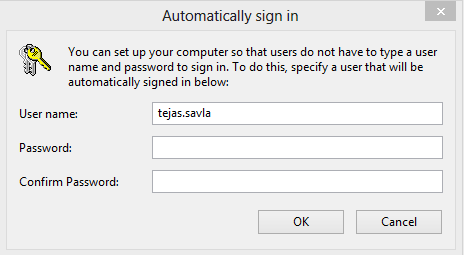 Now, a "Automatically sign in" pop-up window will appear that would ask for your account username and password. You can enter your user name followed by a strong password for the account selected for which you want to skip the login screen and boot directly to desktop. You will have to re-enter your password to confirm it is the same as you entered in above password box. Finally, click 'OK' and restart your PC to check if these changes have activated the automatic boot to Windows 10 start screen. If some day you want to turn off this automatic login for your Windows OS, you can simply follow the above process till step 4 and tick the check box for mandatory user login during startup. How to boot automatically to Windows 10 desktop using Registry? Open the Run command box by pressing keys 'Windows' and 'R' simultaneously. Type "Regedit" in the dialogue box and press 'Enter' key to continue. If UAC (User Account Control) box opens up, click 'Yes'. Now, on the right-hand side section, search for an entry labeled "DefaultPassword". If no such entry is present, create one by right-clicking on empty area and clicking 'New' followed by 'String Value'. Rename it as 'DefaultPassword' and enter your own password in the below "Value data" field before saving it by clicking 'OK'. After having set the password, all you need to do is activate the auto logon feature. 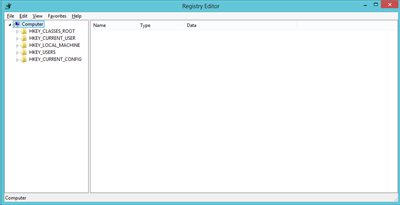 For this, search for the entry named 'AutoAdminLogon' on the right-hand side section of Registry Editor files. Change the string value of 'AutoAdminLogon' from '0' to '1'. Just Exit Registry Editor and try to restart your PC to check if automatic logon has been enabled. If you want to disable the Windows 10 automatic login configuration as done in above steps, you can simply delete the 'DefaultPassword' string and change the string value of 'AutoAdminLogon' from '1' to '0'. Really good information to fast boot the system. Can we install the Windows 8 and Windows 10 in a single PC? Is it possible working on both OS parallel. How much RAM and HDD Space is required to use both the Windows 8 and Windows 10 SO in a single PC. That is a great information for all those who have migrated to Windows 10. A better way to fast boot your OS. And your tutorial is too impressive with the step by step explanation. @Aidan: Thanks for your comments here. Yes, it is possible to have both Windows 8 OS and Windows 10 Technical Preview version on the same PC. However, if you only have 1 PC at home which is your source for all online activities, then, you should not try it. Since, Windows 10 final version is yet to be released and this Technical Preview version is a pre-final version which may contain some issues / bugs. Hence, you need to try out this version on your spare laptop or spare PC that you may have. Thanks for your appreciation. I am glad that you liked it. Do try this way of booting your Windows OS and share your experience here.